Gold futures, Feb. 4, 2019. Click chart to enlarge. The best trading opportunities so far in 2019 have been in oil futures. Last week was no exception, and Nat’s oil trades returned a potential profit of $560 for the week, despite being stopped out (by five cents) on Thursday. But the trade we liked best this week was a long trade in gold futures. Nat’s inflection points are designed to indicate significant changes in market behaviour, most frequently the point where the market changes short-term direction. That’s precisely what happened with this call. Her entry level was hit right at the open on a massive sell-off on heavy volume. The market reversed at that point and moved up steadily into the close. 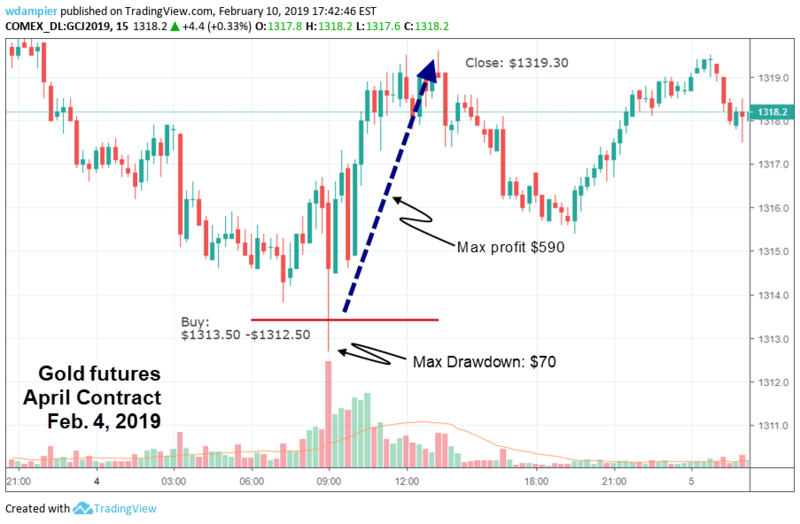 The maximum drawdown after the entry was only $70, which made it an easy position to hold, and an exit market-on-close caught most of the day’s action, and returned a potential profit of $590. The call was posted on Nat’s website overnight, and was easily executed with a limit order set in advance. The trade was even available to Nat’s weekly members, who get a free peek at the Monday calls.